// Embedded represents a message embedded in SimpleMessage. 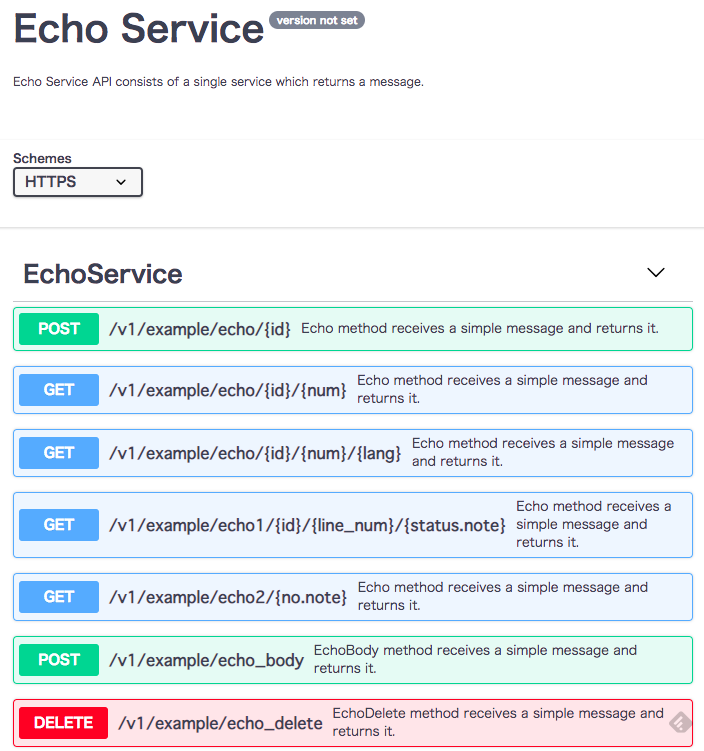 // SimpleMessage represents a simple message sent to the Echo service. // Id represents the message identifier. // Echo service responds to incoming echo requests. // Echo method receives a simple message and returns it. // EchoBody method receives a simple message and returns it. // EchoDelete method receives a simple message and returns it. // Run starts the example gRPC service. // "network" and "address" are passed to net.Listen. $ curl -vvv -X POST "http://127.0.0.1:8080/v1/example/echo/hoge" -H "accept: application/json"
$ curl -vvv -X POST "http://127.0.0.1:8080/v1/example/echo/hoge?en=1&status.note=done" -H "accept: application/json"